We’ve gathered here together. . .
Ack. Wrong speech. I can honestly say that’s one of the few things I didn’t fear while speaking to a large crowd in Ohio last week: Opening up my mouth and having all the wrong words come out. Also not worried about? Laughing uncontrollably and inappropriately, a fear that has kept me from being a reader in church, speaking at any funerals, and becoming a teacher. When I get overwhelmed with anxiety, I laugh. Not good in serious situations or during CAT testing week. The fact that I was not worried about spewing nonsense and laughing is really only because I was on worry overload. I was already anxious that no one would laugh at my LeBron joke or that a swear word would slip out. Or that I would have to go to the bathroom again, just in case 14 times in two hours wasn’t enough. When I was asked to speak at this function, it was something like 9 months ago. I am just immature enough that if someone asks me to do something, I’m more likely to say yes, regardless of how far in over my head I am, because I have these unrealistic expectations of what is going to happen between now and then. 1. I would become a professional, trained actress. 2. I would die in a plane crash on my way to Ohio to give the speech. 3. Ohio would be fracked to death and all speaking engagements that addressed anything other than how to survive on ash and rubble would be cancelled. As it turns out, I did OK. People did laugh at my LeBron joke (and I give full credit to my son, Jack, who gave it to me a day and a half before the speech. I had practiced the darn thing so many times. I obeyed my smiley face reminders on my notecards, and the WKSU guy who advised me to turn my head but not my mouth, so that when the speech was broadcast on radio, I didn’t appear to be one of the Mandrell sisters bouncing all over the stage. I am counting this as one more step up the ladder in being a decent public speaker, following my son’s advice that “you can’t get good at something unless you fail at it a couple of times.” I did better in Ohio than I did on the Today show three years ago. Although, I stopped feeling bad about the Today show a few months ago when I saw Kate Gosselin on there being so mean to her daughter. I turned off the TV and said to myself, “I might have been lame on the Today show but at least I wasn’t mean on the Today show.” And then I wrapped the final ribbon around that whole package and put it in the gifts-that-keep-on-giving closet. In a few weeks, I’ll muster up the courage to listen to my Ohio speech on WKSU and critique myself before sending it to the same closet. And then, watch out: Eventually I could be cracking LeBron jokes at a funeral near you. 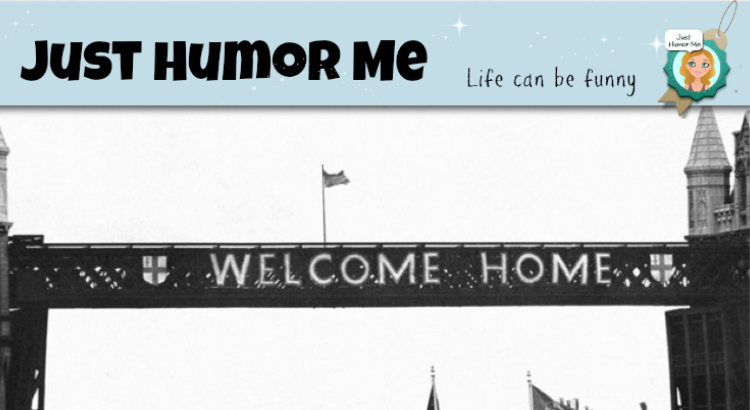 Read more of Diane’s Just Humor Me. There are now seven years’ worth. Sign up for our weekly e-newsletter and get new blog posts and other neat stuff. And if you like her blog, you’ll love her book, Home Sweet Homes: How Bundt Cakes, Bubble Wrap, and My Accent Helped Me Survive Nine Moves.